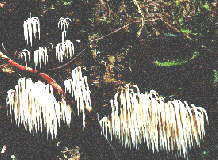 Toothed fungi are from the families Hydnaceae and Echinodontiaceae. The family Hydnaceae contains organisms producing their basidia on tooth-like projections. The basidiocarps in these species are quite variable and may resemble crusts, brackets or shelves, mushrooms or coral. The fruiting bodies are generally soft and more gelatinous than those of most others in the same order (Aphyllophorales). In all tooth fungi, basidia are produced on positively geotropic spines, granules, or structures resembling warts. Some grow on the wounds of living hardwoods, some on rotting pinecones and others on living conifers, most of them growing especially during heavy rainfall periods. The single genus Echinodontium from the family Echinodontiaceae has a common species called Echinodontium rinctorium. This produces woody, hoof-shaped fruiting bodies on conifers. The hyphae growing within the tree cause serious rotting.